As we wrap up our work on the Early Wearables Kit, the MLab has been happy to see the Kits for Cultural History project referenced in several academic publications and media outlets. In his new book, Conversations in Critical Making (CTheory Books, 2015), Garnet Hertz includes an interview with Jentery that explores the Kits project in general, and the Wearables Kit in particular. You can read the conversation between Hertz and Sayers on ctheory.net or in the open-access, PDF version of Hertz’s book. The Kits are also referenced in Rebekah Sheldon’s chapter, “Object-Oriented Ontology and Feminist New Materialism,” in The Nonhuman Turn (Richard Grusin, ed., U. of Minnesota P., 2015). Sheldon describes the Kits as a “compelling alternative” to distant reading. Elsewhere, Jentery’s Scholarly Research and Communication article, “Why Fabricate?” (Issue 6.3, 2015), focuses more generally on the MLab’s ongoing fabrication research, including ways to remake technologies that no longer function, no longer exist, or exist only as illustrations or fictions. This month, UVic published a short article detailing the Wearables Kit. 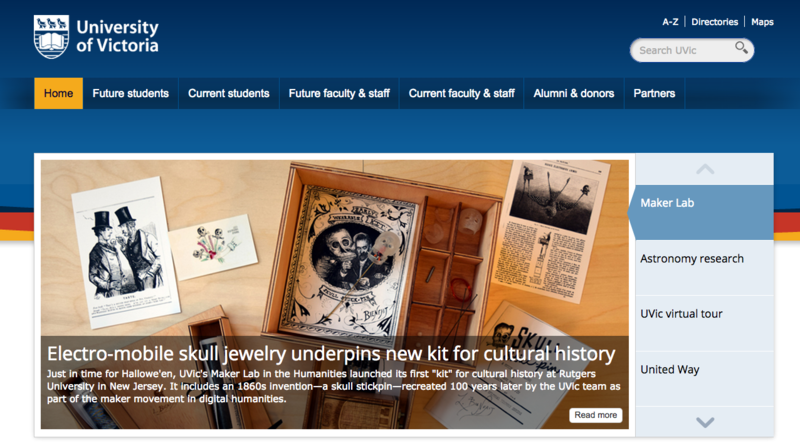 The university also featured the Kits on its homepage. On October 29th, CBC’s All Points West (90.5FM Victoria) hosted Jentery for a conversation with Robyn Burns about the Kit and our work at the MLab. Soon, we’ll be launching the Wearables Kit online, together with publications in Hyperrhiz and Visible Language. Post by Katherine Goertz, attached to the KitsForCulture and Makerspace projects, with the fabrication tag. Featured image for this post care of UVic and the MLab.